I was lucky to be asked to write five articles for Wired’s Change Accelerator blog on the topic of Future of Entertainment this last week. Guest bloggers sound off on solutions for the future. Eight change accelerators in energy, mobility and design start the conversation, and you join in. So here is the list of my experiential & transmedia posts this week in Wired’s Change Accelerators Blog – these may be re-posted on this blog once I get the nod. I promised quite a few folk to provide a walk-through of my short 35 minute presentation at the Augmented Reality Event in California last week. The intention of the presentation was to take my AR Scenario & Business Model thinking to the next level, to go beyond marketing eye candy, clunky ‘questionable’ games and really dig down and think hard about the value proposition for users. In creating the presentation I had to look at a deeper level at the nature of experience, as in that we can start to really find true value in Augmenting our Reality. To begin though a little compilation video I threw together for this post and some future talks looking specifically at a range of locative augmented and alternate reality services (entertainment, promotion and advertorial) to set the landscape. The only way the Augmented Reality industry is going to emerge from its current commercial birthing period is for the brands, corporates & creatives to make sure that AR is delivering a unique, immersive experience and to start to consider the value of experiential (a marketing definition here). This nature of experience, which I believe is inextricably linked to the future of AR, and the value users place on immersive services also leads at the end into a ‘experiential’ panel I am leading at Creative Sydney at the Opera House this week and I cover some of my thoughts in that space first. A nice little toy to play with down below which has resulted from a few recent think streams. 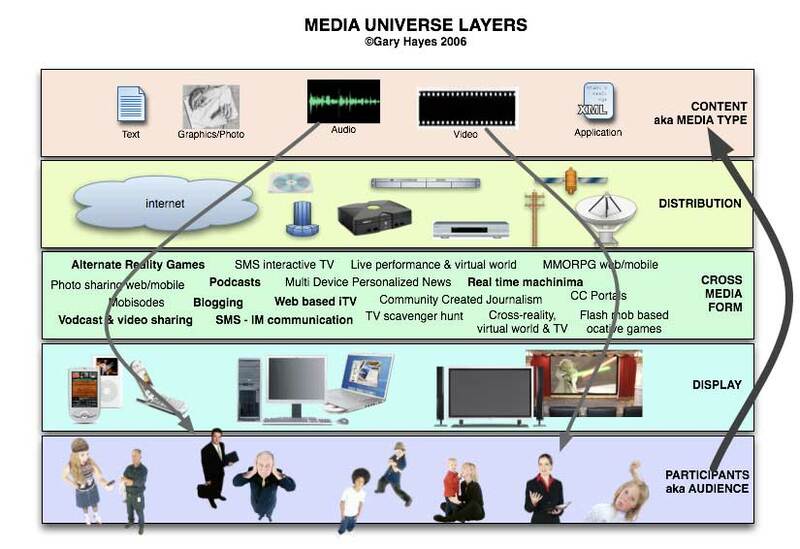 I have been thinking hard about the potential millions of formats that can be created by mashing the many traditional media forms with even more new media forms – endless combinations of genre, platform, structure, intention and so on. This is nothing new for me as last century I was busy producing BBC cross-media forms, then working on the TV-Anytime (Mpeg7-21) classification dictionaries and of course recently leading LAMP and its transmedia work. I have blogged about media forms many times and regular readers may remember this simple ‘Media Universe’ diagram (right), that talks about community created content (including professional producers) but really about separating distribution from screen from media type so you can identify form(at) for audience.